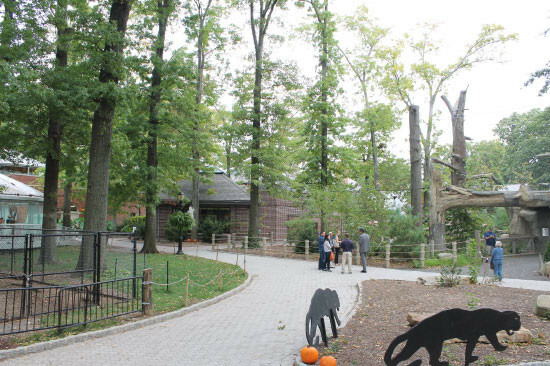 Our intrepid Archtober team ventured across the New York Bay to usher in the weekend with a visit to the Staten Island Zoo. 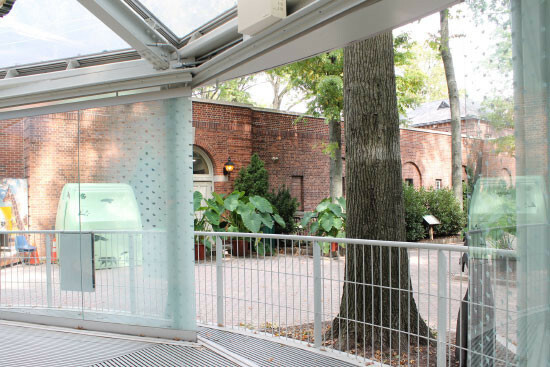 After a breezy ferry ride (along with some time on the subway, bus, and our own two feet), we met up with James Slade, who, together with his wife and partner Hayes Slade, designed the Staten Island Zoo Carousel Enclosure. Ken Mitchell, zoo director, stopped by to give us some information about the zoo, which opened in 1936 and had 190,000 visitors last year. 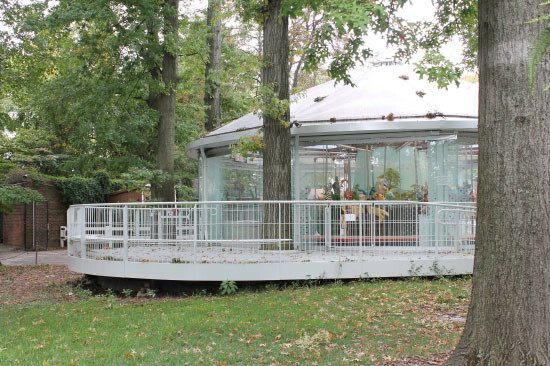 A master plan developed by Gruzen Samton had called for the carousel to be located near one of the zoo’s entrances, but James and Hayes decided instead to site it closer to the central building and facilities, near the children’s zoo and reptile house, two highlights of the facility. The Department of Cultural Affairs manages the buildings and zoo, while the Parks Department owns the land. All parties involved agreed that it was important to minimize impact on the landscape, which includes many mature trees. 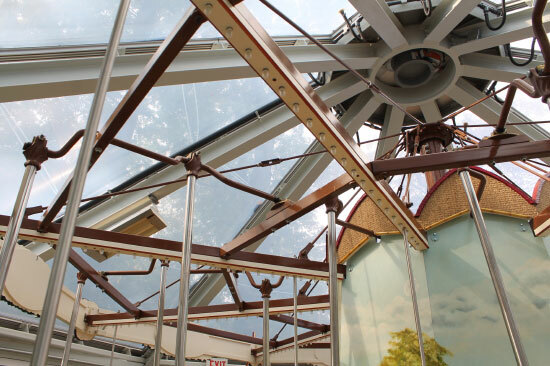 They avoided deep excavation work by setting the carousel enclosure on a diamond pier foundation system in which metal pins are hammered into a base to create a pincushion effect. Only one tree was lost to the carousel, leaving a verdant canopy above. 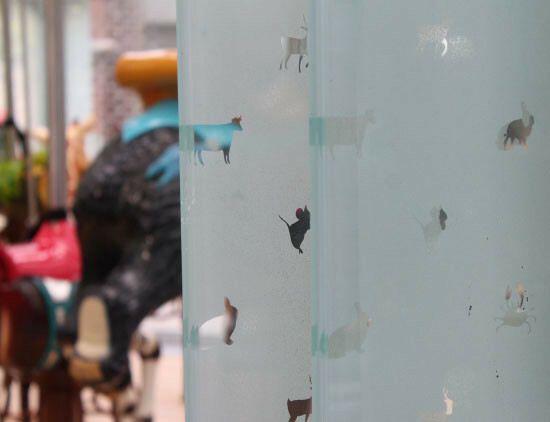 Young riders can look up and see the sky through the ETFE roof, which lets in light so that passersby can admire the fine craftsmanship that went into the hand-carved and hand-painted wooden animals. The leopards looked like they wanted some attention, so Slade took us over to see the enclosure that his firm had also designed. 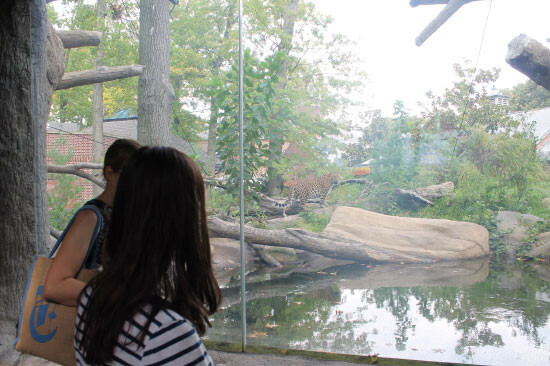 After spending most of their lives in an indoor exhibit, the leopards are finally free to roam outside in their spacious new home, which was created with environmental enrichment in mind. Climbable trees and deadfall encourage mental stimulation and physical health, while a heated rock by the observation area provides a cozy spot in cold weather. When the leopards want to get away from human eyes, they can retreat to hiding places that were designed into the space. We’ll be back in Staten Island next week to see the newly-opened Staten Island Museum at Snug Harbor.